In total size Lake Erie is the 12 largest freshwater lake in the entire world, but for Ohio, it is the state's biggest fun place to go. 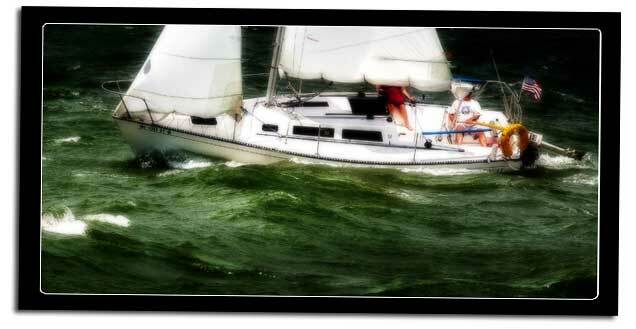 Wind, water, sun and sand make for long summer days where Ohioan's go to get away. For some visitors to Ohio's North Coast, its like a little trip to the Caribbean, especially if you ferry out to the islands. All along the coast are both small and large communities, parks and state park beaches. Because of Lake Erie's shallow depth, the water changes temperature faster than any of the other Great Lakes. 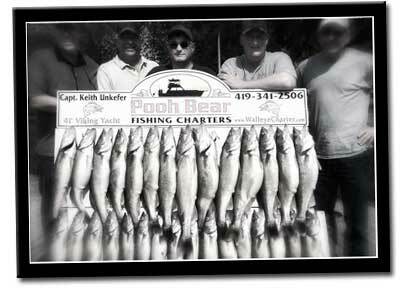 That means in the spring, Lake Erie becomes an ideal fishing destination because of the large runs of walleye and perch. In the summer, the warmer water makes swimming more pleasant. In the winter, well we all know what winter is like along Lake Erie: it is cold and snowy. In fact, Cleveland is one of the snowiest places in the lower 48. But, did you know that because the lake freezes so quickly, it actually has a moderating effect on our climate? That little climatological detail means that the land along the southern shore of Lake Erie have been given their very own varietal zone that is ideal for growing grapes and not just any grapes, but grapes that make excellent wines. Because of the unique climate, Ice Wines are also a highly prized product of the area. It was precisely because of the coast's moderate climate that attracted early explorers and later urban citizens looking for a place to go to get out of town away from the stench of over-crowded urban life. 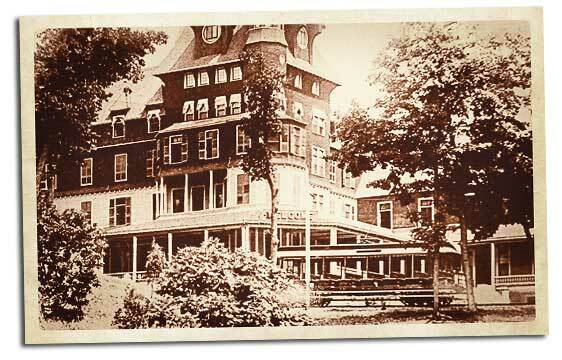 During the Victorian period in the America, places like Hotel Victory, Lakeside, and Cedar Point became not only popular destinations for Ohioans, but also for residents from all over the Midwest. A number of presidents often spent their summer months away from Washington living on the islands. In total area, Lake Erie is the 12th largest freshwater lake in the world and the most shallow of the 5 Great Lakes. It is about 210 miles long, 57 miles wide, with a shoreline of approximately 71 miles with a maximum depth of 210'. In the western basis of Lake Erie are a number of islands left over from the last ice age. Each island has its own character and charm. These islands have long been popular destinations, first for the Native Americans that came here for the protection the isolated pieces of land provided, but also the great fishing. Not long after the land became a state, the area again became a popular tourist spot attracting visitors from across the country who would arrive here by large steamers. The beaches of a little jut of land just south of Kelley's Island known as Cedar Point also became a popular tourist spot for its pristine beaches. So many tourists were arriving each summer that a proprietor decided to add a few rides for the kids and the amusement park industry had arrived on the shores of Lake Erie, never looking back. Over the ages, numerous ice age glaciers helped carve out the Lake Erie basin. Today you can still massive bedrock that was notched by the weight of tons of ice sliding over it on its way into southern Ohio. When the ice melted, large areas of softer limestone and salt beds had collapsed under the weight of the glaciers that left a shallow depression. As the climate warmed, the glaciers melted forming streams and rivers that flowed into that massive depression as they still do today. For the most part Ohio's rivers flow south except for a line that runs roughly through where the glaciers were the heaviest. From that area the rivers flow north, into the lake. It is these rivers that help maintain the water levels of the lake and provide the spawning grounds for many of the lake's abundant fish. 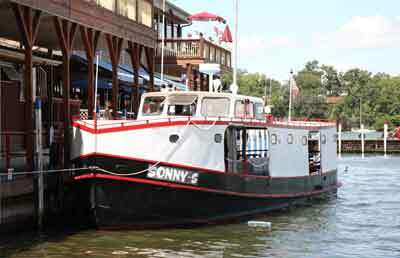 In fact, the southwest section of the lake between the Sandusky and Maumee Rivers has become known as the walleye capital of the world. Because of the lake's shallow depth, Lake Erie offers some of the finest walleye, smallmouth bass and yellow perch fishing in the country. Even during the colder months, Lake Erie offers quality fishing for steelhead trout. Marblehead Lighthouse is Lake Erie's best known and most-photographed landmark. 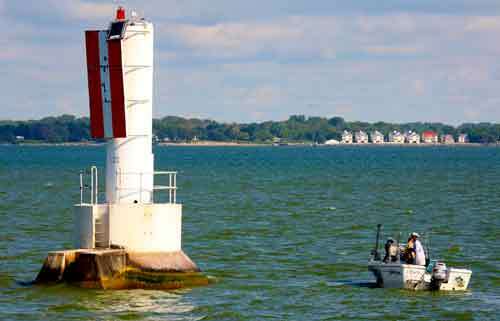 The grounds surrounding the lighthouse offer excellent picnicking and views of Lake Erie, Sandusky Bay, Kelleys Island and South Bass Island. If you visit when the lighthouse is open, for a very small fee you can climb the narrow spiral stairs to the top for a really great view. Besides the famous lighthouse, there is also the small village of Marblehead, Lakeside, and Port Clinton. 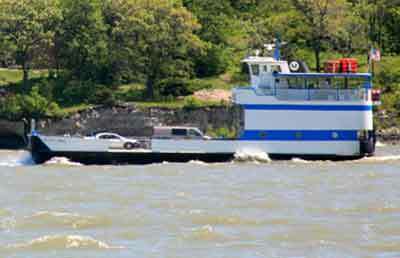 Several ferry's also have ports along the peninsula. The best way to see the islands is to leave your car on the mainland. Many of the ferry services offer parking. On the islands you can usually rent bicycles and carts to get around. Reservations are not required, it is first come, first served. The one exception are trips to Middle Bass Island. This has a more limited service and vehicles may need a reservation-- people do not. Weather can be a deciding factor when ferries run. High winds can cause delays, and obviously when there's ice-over, there will be no service. There are at least 36 “real” islands in Lake Erie, but an exact count depends on what you decide to include or exclude. Some islands were listed on 19th Century maps, but are now connected to the mainland or submerged. 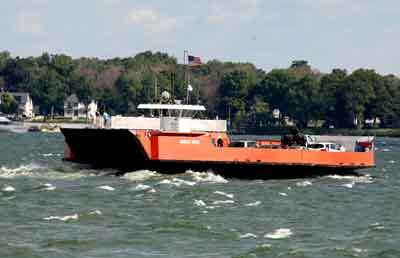 Other islands are not quite in Lake Erie such as Johnson's Island in Sandusky Bay. Still other islands are just mere dots of land such as Starve Island just south of South Bass Island. The islands remained sparsely settled until 1854 when J.D. Rivers purchased 5 of the major islands. At first he turned Put-In-Bay into a sheep ranch, having at one time a herd of 2,000, but eventually he converted the island into a fruit farm. Despite the extreme northern location, the islands have the longest frost-free period of any area in Ohio due to the stabilizing effect of the lake's warm waters. It soon became apparent to islanders that the cultivation of grapes was very profitable. The grape culture has had a dramatic influence on the islands, sometimes called the "Wine Islands." By 1887, more than 1/3 of the grape produced and nearly 1/2 of the wine produced in the entire state was credited to this area. Wines from these islands were once pronounced by the best judges as being comparable to the best productions of France. Several island wineries still exist today. When French explorers and traders entered the Great Lakes region in the 1600s, American Indian nations already had given names to the immense bodies of water they lived along. As reports and crude maps filtered back to Europe, these Indian names frequently were combined with names the French thought more appropriate. Cedar Point has more rides and roller coasters than any other park in the world. It also has an 18-acre water park, beach, four resort hotels, RV campground, cottages and cabins and 2 large marinas. Near Cedar Point-Lake Erie Amusement Park 18-acre water park with a wave action pool, body and tube slides, inner tube rivers, and Splash Zone. 33000 square foot indoor water park with a 4 story water tree fort, 7 slides, 5 pools and 2 giant hot tubs. Lake Erie Ohio. 1-800-521-2660 Take a drive and see wild animals up close from your car! Gift shop, picnic facilities and a cafe & grill. Lake Erie Ohio. A Lake Erie Amusement Park and Outdoor Waterpark. Typhoon water slide, adventure island tree house and oral reef river ride. Swim up to the tiki bar or play a game at Gilligan's Arcade.